State effects of imbalance in machine. 1. Imbalance imparts vibratory motion to the frame of the machine. 2. Produces noise which leads to human discomfort. 3. Detrimental effects on the machine performance & structural integrity of the machine foundation. State reasons for balancing of rotating elements of machine. Explain balancing concept. Reasons for balancing of rotating elements of machine: The balancing of the moving parts both rotating and reciprocating of such machine is having greater importance. Because, if these parts are not balanced properly then the unbalanced dynamic forces can cause serious consequences, which are harmful to the life of the machinery itself, the human beings and all the property around them. These unbalanced forces not only increase the load on the bearings and stresses in various members, but also produces unpleasant and dangerous vibrations in them. Ω = angular speed of this part in rad/sec, and r = Distance of the center of gravity of mass from the axis of rotation of part in m.
For the balance of rotating masses, it is the centrifugal force which is to be balanced. This type of problem is very common in steam turbine rotors, engine crank shafts, rotory compressors and centrifugal pumps. Four masses A, B, C and D are attached to a shaft and revolve in the same plane. 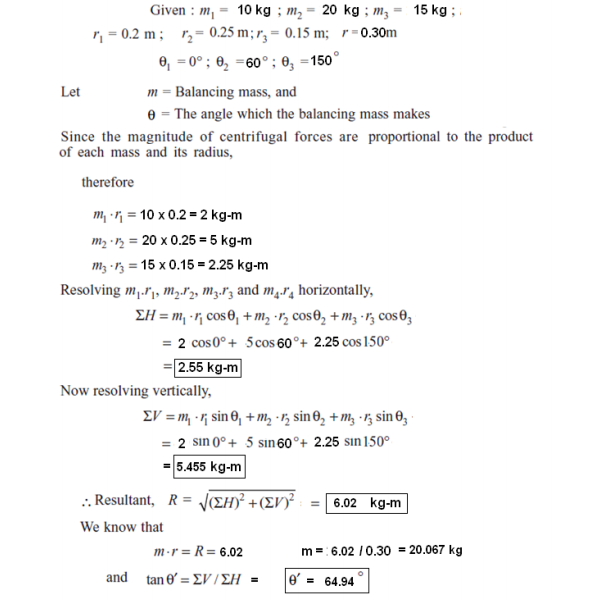 The masses are 12 kg, 10 kg, 18 kg and 15 kg respectively and their radii of rotations are 40 mm, 50 mm, 60 mm and 30 mm. The angular position of the masses B, C and D are 60O, 135O ,and 270O from the mass ‘A’. Find the magnitude and position of the balancing mass at a radius of 100 mm. Use graphical method only. Why is balancing of rotating parts necessary for high speed engines ? 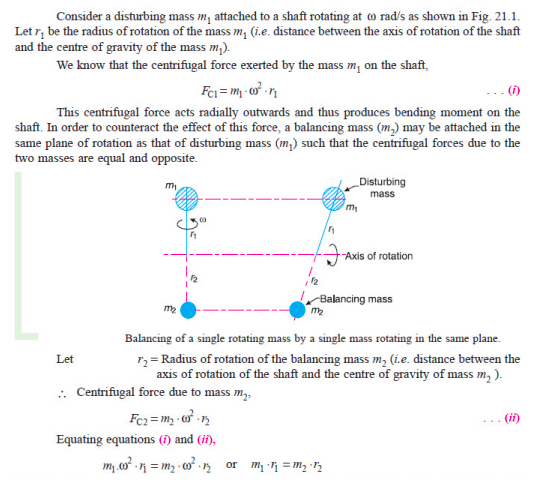 Write the procedure for balancing of a single rotating mass by single masses rotating in the same plane. 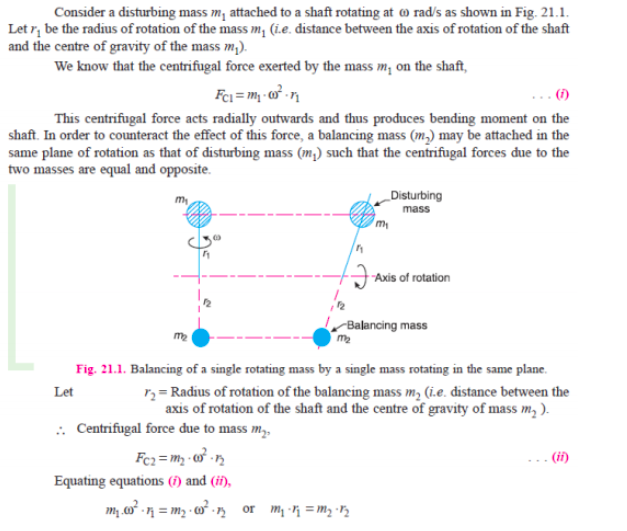 Procedure :Balancing of a Single Rotating Mass By a Single Mass Rotating in the Same Plane Consider a disturbing mass m1 attached to a shaft rotating at ω rad/s as shown in Fig. Let r1 be the radius of rotation of the mass m1 (i.e. distance between the axis of rotation of the shaft and the centre of gravity of the mass m1). We know that the centrifugal force exerted by the mass m1 on the shaft, FCl= m1.ω2 . r1 . . . (i) This centrifugal force acts radially outwards and thus produces bending moment on the shaft. 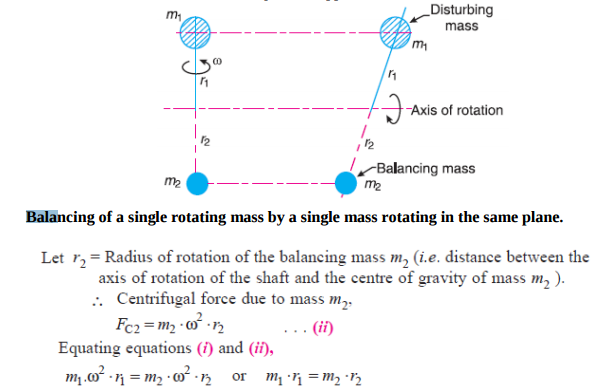 In order to counteract the effect of this force, a balancing mass (m2) may be attached in the same plane of rotation as that of disturbing mass (m1) such that the centrifugal forces due to the two masses are equal and opposite. 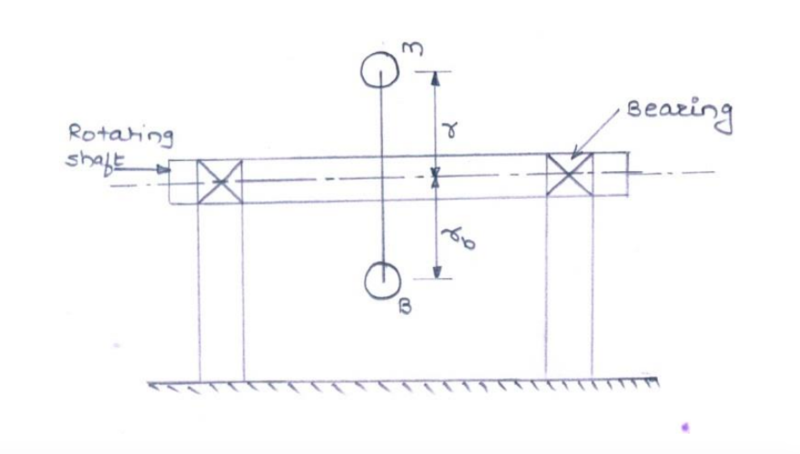 Four masses attached to a shaft and their respective radii of rotation are given as : m 1 = 180 kg m 2 = 300 kg m 3 = 230 kg m 4 = 260 kg r 1 = 0.2 m r 2 = 0.15 m r 3 = 0.25 m r 4 = 0.3 m The angles between successive masses are 45, 75 and 135. Find the position and magnitude of the balance mass required, it its radius of rotation is 0.2 m. The masses revolve in same plane. Why is balancing of rotating parts necessary for high speed engines? Write the procedure of balancing single rotating mass when it balance mass is rotating in the same plane as that of disturbing mass. A rotor having the following properties : m1 = 4 kg r1 = 75 mm θ1 = 45o m2 = 3 kg r2 = 85 mm θ2 = 135o m3 = 2.5 kg r3 = 50 mm θ3 = 240o Determine the amount of the countermass at a radial distance of 75 mm required for the static balance. Three masses 10 kg, 20 kg and 15kg are attached at a point at radii of 20 cm, 25cm and 15 cm respectively. If the angle between successive masses is 60° and 90°. 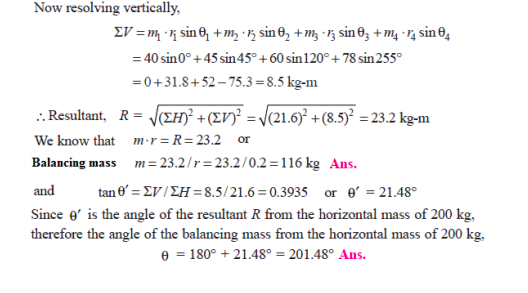 Determine analytically the balancing mass to be attached at radius of 30cm. 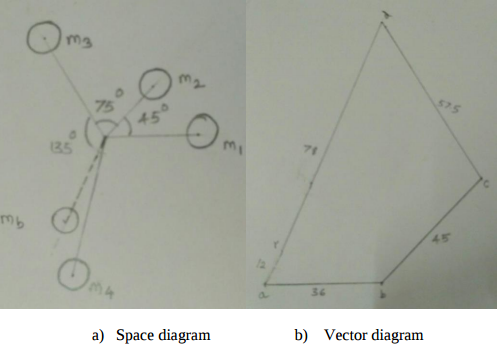 Explain the process of balancing of single rotating mass by a single mass rotating in the same plane. r = Distance of CG from axis of rotation. 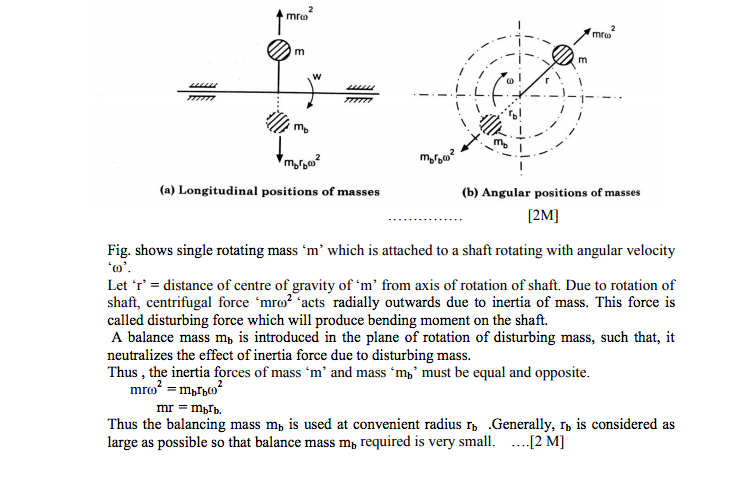 M = Mass attached to shaft. Due to continuous rotation of shaft the centrifugal force developed will be continuously changing its direction. It will cause bending moment on shaft. To counter act the effect of centrifugal force the balance weight may be introduced in same plane of rotation. This balance weight should be attached it will result in exactly equal but opposite centrifugal force to that of disturbing weight ‘M’. 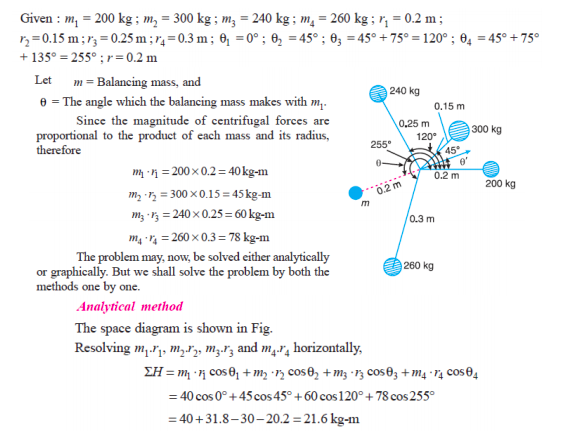 The balanced centrifugal force is given by Fb = mbw2Rb For balancing the shaft – Mw2R = mbw2Rb. The high speed of engines and other machines is a common phenomenon now-a-days. It is, therefore, very essential that all the rotating and reciprocating parts should be completely balanced as far as possible. If these parts are not properly balanced, the dynamic forces are set up. These forces not only increase the loads on bearings and stresses in the various members, but also produce unpleasant and even dangerous vibrations. The balancing of unbalanced forces is caused by rotating masses, in order to minimize pressure on the main bearings when an engine is running. Three masses 10 kg, 20 kg and 15 kg are attached at a point at radii of 20 cm, 25 cm and 15 cm respectively. If the angle between successive masses is 60° and 90°. 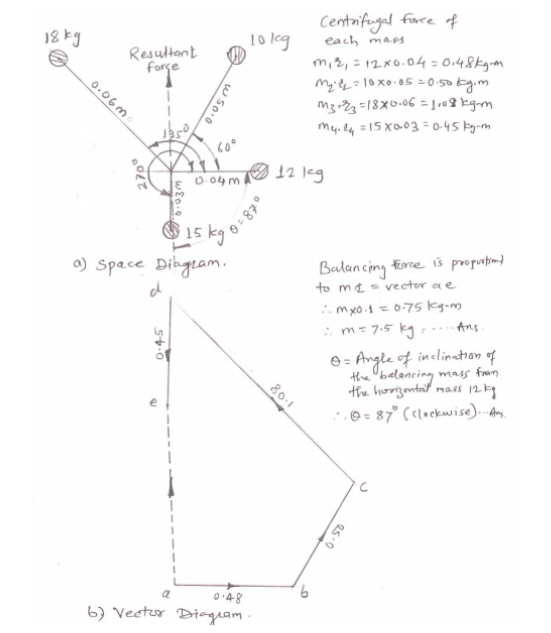 Determine analytically the balancing mass to be attached at radius of 30 cm. The dynamic forces are set up. These forces increase the loads on bearings and stresses in the various members. Also produce unpleasant and even dangerous vibrations. State the procedure of balancing single rotating mass when its balancing mass is rotating in the same plane as that of disturbing mass. Four masses m1, m2, m3 and m4 are 200 kg, 300 kg, 240 kg, and 260 kg respectively. The corresponding radii of rotation are 0.2 m, 0.15 m, 0.25 m and 0.3 m respectively and the angles between successive masses are 45°, 75° and 135°. 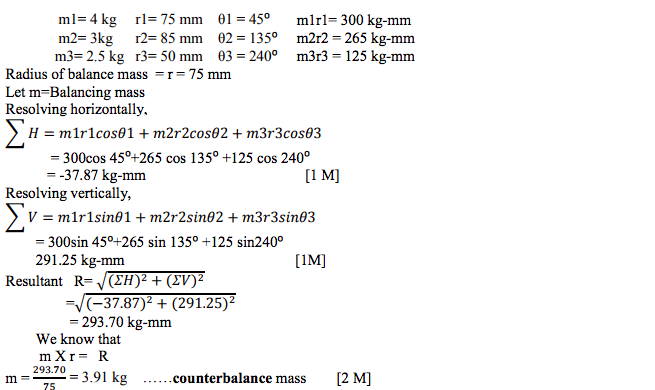 Find the position and magnitude of balance mass required, if its radius of rotation is 0.2 m.